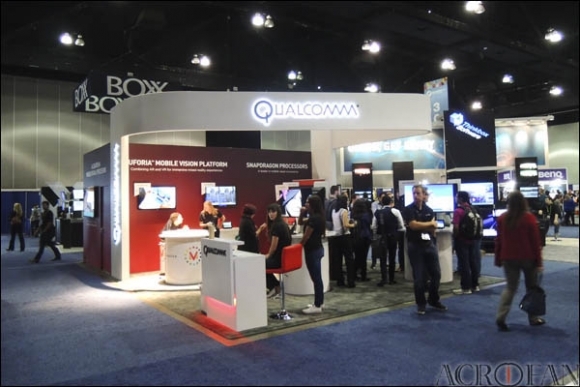 Qualcomm is the most ‘unexpected’ company in SIGGRAPH 2015 exhibition. 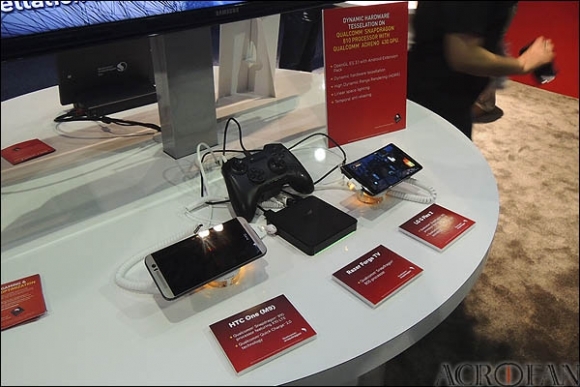 Qualcomm make their show booths in SIGGRAPH 2015, and briefing their new GPU IP ‘Adreno 530, 510’ and ISP using with next generation snapdragon SoC. Qualcomm only announced their new GPU and ISP in SIGGRAPH 2015 because the next SoC’s debut schedule is too far and consider to the characteristic of ‘SIGGRAPH 2015’ I guess. Snapdragon 820 is Qualcomm’s next generation flagship SoC, and the guideline of performance of next year’s flagship smartphones. The feature and performance of Adreno 530 GPU can guess graphic performance and power efficiency of next generation smartphones, and make the trend of display and camera that affect many smartphone’s differentiation strategy. These kinds of changes make whole industry changes because mobile platform is one of the most important contents consumption platforms. Many values required to next generation SoC that high performance and high power efficiency, small footprint and many feature set is conflictingly many time. But technical solution that applied to the new process and architecture, optimizing platform and software compromise with that conflictingly things to higher level. Qualcomm’s announce about Adreno 530 GPU and ISP was including their concern and solution of next generation SoC and platform a little. ▲ This kind of performance gain has architecture changing with SoC usually. Qualcomm told that the Adreno 530 GPU’s graphic performance is 40% up from Adreno 430, 40% low power consumption from Adreno 430 when same workloads. I can’t certain the test configuration exactly, but one of the reasons of performance gain is memory subsystems if consider test display configuration has FHD or 2K display at least. Usually memory interface is most SoC’s point of performance bottleneck if the SoC using shared memory architecture between processor and GPU. 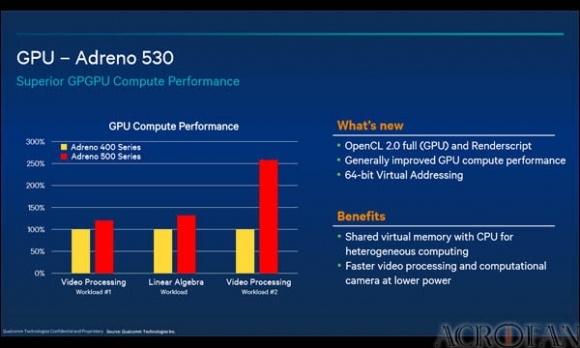 Qualcomm said that Adreno 530’s goal of design is performance, power efficiency, and maximize the performance per watt. So, already qualcomm applied some hardware, software technologies about reducing memory bandwidth use. One of these technics already many GPU company uses that is texture compression and drop the invisible surface from rendering task based Z-buffer. That kind of technics can reduce SoC’s memory bandwidth and archive some performance gain and reduce power consumption. The fundamental solution of this kind of concern is using higher physical memory bandwidth. Snapdragon 820 using LPDDR4, that is already using with snapdragon 810 but 820’s LPDDR4 can run in higher frequency. Added channel in memory controller is not suitable for this problem because footprint and cost. So I guess physical memory performance of snapdragon 820 SoC is better only a little-bit than 810 but 25.6GB/s of 810’s LPDDR4 bandwidth is not bad performance in now. Hardware based ‘Compression technology’ is good choice of solve memory bandwidth problems between GPU and memory. 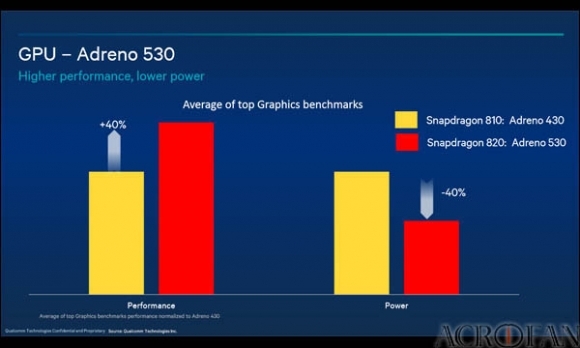 In my opinion, this kind of improvement make boost of performance and efficiency for Adreno 530. Qualcomm announced that the bandwidth compression ratio is 2:1 for memory, 3:1 for VPU, IPU, and provide 50% higher efficient compared to previous generation. Using the latest high speed memory with minimal serial connection and applying compression technology for boost efficiency is very effective ways of mobile platforms that have tight limitations of physical and logical resources. Latest mobile platform provide high graphics, gaming performance beyond expectation in high resolution display even many tight limitation, because their effort of raise performance and reduce footprint and power consumption. But ‘Data compression’ technology have some technical issues need to solve. Usually compression technology in data bus makes performance variations problems depending on data, application types. But this kind of technology have more advantages in mobile platforms even some users don’t like that. And QoS management technology in SoC can solve that kinds of problems, so Qualcomm applied this technology in 820 SoCs. One of important tasks of the next-generation SoC is make other ways of using big GPU in SoC not only graphics but other tasks. Almost modern GPU has ‘unified shader’ architecture and available to use for general-purpose such as OpenCL. But most of SoCs uses other IP instead of GPU for special features of multi-media support, because power and performance efficiency. When Qualcomm announced performance of Adreno 530 GPU, they introduce GPGPU performance based on OpenCL separate to graphics performance. 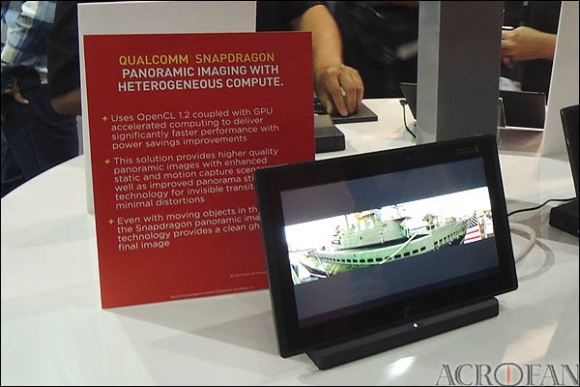 Truly, almost latest GPU can be supports OpenCL 2.0 with shared virtual memory like Qualcomm’s new GPU. But Qualcomm’s special point is replace some discrete IP to GPGPU-based software features and it can improve competitiveness in mobile platform that converged to software and hardware very closely. Image and video processing that using traditional discrete IP is the easiest parts of performance boosts to using GPGPU based on modern GPU with OpenCL in mobile platform. Replace discrete IP to GPU-based software function is good choice for performance boost and improve efficiency in SoC’s footprint if the new generation SoC success to solve their GPU’s efficiency when using OpenCL. And it can make more flexible to support new standard and technology. Camera performance of the smartphone is the result of combined to hardware modules and software performance. Sometimes we can find that camera performance is various changing when just using another camera software even on same modules and phones. If the camera apps use GPGPU for make panorama image, image filter, HDR, noise reduction and many pre- or post-processing, it can make most powerful performance of overall camera performance then other apps or phones only using CPU or IPs. Device manufacture’s default app has advantages in optimization if GPGPU technology applied to use in apps. Third-party apps usually focused to use CPU instead of GPU because they need to measured compatibility of many versions of platforms, OS, software environments, and a lot of devices. But manufacture’s default app is measured and optimization with only specific hardware and software configuration. And, SoC vender encouraged more to use that kind of technology because the perfection of default app make images of completion of device and ability to compete. In my opinion, SoC vendor like Qualcomm need to support more for third-party companies or developers, and make some kind of promotions for use GPGPU to their applications. GPU has general-purpose operation abilities and prepare API to use GPU, but only few applications try to use that because lack of make opportunity for using GPGPU application. So, I suggested to make new promotion programs for developers and companies using GPGPU to their apps because boost competitive of SoC and device levels. ▲ The meanings of Qualcomm’s entry in SIGGRAPH is not an picnic I think. Many people focused on the manufacturing process of ‘Snapdragon 820’, but using ‘FinFET’ is only well known of that. Of course, only a few companies have ‘FinFET’ process technology for mass production or have plans, and many people guess that is only choice one of two well-known companies. But we don’t know about progress of build their factories for production, I just can ‘guess’ but not sure. Performance gain in modern SoC is not simple to achieve only manufacturing process because modern process is already near to bit the physical limitation. And modern generation of ARM architecture is not simple, low power-consumption, and need to modify and optimize to new trend of maximum performance in limited resources. But ARM has an advantages than x86 in optimizing because unweighted of legacy architecture support. How to use powerful and big GPU in various way is the key of making competitive in next-generation mobile platforms. Encouraging GPU utilize in platform can change architecture of SoCs to more efficiently, and make performance advantage that users can experience. It is very interesting point that snapdragon 820 can make a chance of change overall direction of device, SoC design in market.